21st of April, Sunday. 8AM - 10AM. Egg Hunt + Breakfast. Unlimited playtime! 9:00AM - Egg Hunt Begins! Upon submitting this form, I declare that I am the parent/ rightful guardian of the child whose name is stated on this form. As the purchaser of this Easter Ticket that will provide admission to my child/children and also to my guests to use the facilities and services of Waka Waka at its premises, I understand that admission to Waka Waka is subject to terms and conditions applicable to every child and every visit made. I acknowledge and agree: There are inherent risks of injuries associated with dynamic play between children / persons and the use of our equipment and facilities and I on behalf of my child/children and guest(s) accept these risks. To supervise my child/children and my guest(s) at all times to ensure proper, safe play and not to endanger or cause inconvenience others in the centre. We agree to abide by all rules, signage and directions given by the staff and centre. That I, my child/children and guest(s) shall not hold the operators, owners, franchisor, franchisee, directors and staffs of the centre and all its affiliated companies responsible and liable for any injuries, damages or death resulting from admission, patronage and consumption of services and use of equipment. That the management reserves the right to change its terms and conditions, refuse entry, remove persons from the premises and do whatever else necessary to ensure the safety and enjoyment of its customers without any notice. I have viewed and verified all the particulars I have keyed in are all accurate to my best knowledge. I have also acknowledged the declarations, indemnity and consent to the use of provided information, to be true and correct. 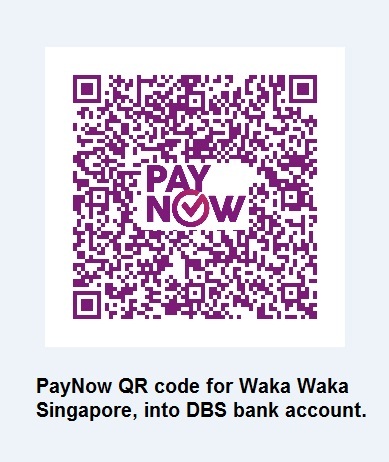 For payment via PayNow, you may scan the QR code or by keying UEN: 201619119R001. Please use the mobile number or name as per the form submitted for easy reference.